(APN) ATLANTA — A class action lawsuit was filed Tuesday, November 17, 2015 in Fulton Superior Court against Georgia Secretary of State Brian Kemp, alleging the State released over six million Georgia voters’ Social Security numbers, dates of birth, and driver’s license numbers to unauthorized individuals. Kemp is charged with willful violations of Georgia’s Personal Identity Protection Act of 2007. Kemp’s office blamed a clerical error for the massive personal information dump and said he did not consider it a breach of security. The information technology (IT) employee responsible for the release of personal information has been fired. Twelve organizations including statewide political parties, news media organizations, and Georgia Gun Owner magazine received the file of unauthorized personal information. Kemp’s office says it has contacted each recipient to retrieve the voter file CD discs. “My staff has verified with the media outlets and political parties that received these discs that they have not copied or otherwise disseminated confidential voter data to outside sources. 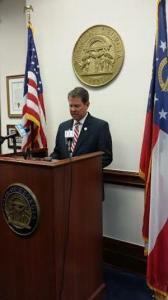 I am confident that our voters’ personal information has not been compromised,” Kemp said. The release of the data happened October 13, 2015–over a month ago–and not a single word was uttered by the Secretary of State’s office, until news media reported the story earlier this week. During the past month, Georgia citizens were not notified that their personal information may be compromised or that they should be on alert for identity theft. Nor had Kemp notified any consumer reporting agencies about the breach that could compromise the security, confidentiality, or integrity of personal information of each Georgia voters, as required under Georgia law, states the class action lawsuit. Gov. Nathan Deal has not ordered an investigation. He has remained quiet on the subject, as have other high-level Republicans. Ironically, as Atlanta Progressive News has reported over the last few years, Georgians have witnessed Secretary Kemp and Gov. Deal react quickly regarding allegations of voter fraud in the past, such as when massive investigations were launched into the Quitman Ten and the New Georgia Project. Both groups were found not guilty of anything. And yet with all the purported Republican concern for voter fraud when it didn’t even exist, especially as an excuse to add obstacles to voting by eliminating acceptable forms of voter ID, the silence of Republicans now is deafening. This double standard of justice is quite transparent, but Secretary Kemp’s actions have been less so. Kemp’s office regularly sends out updated voter lists to certain members of the media and political parties and other subscribers who legally buy voter information from the State for five hundred dollars. The voter file usually contains the voter’s name, address, race, gender, registration date, and last voting date, but no other identifying or personal information. The personal information that was released last month is not supposed to be included on the voter list. In the wrong hands, such information can enable tremendous damage to registered voters in Georgia. With one’s social security number, criminals can open up bank accounts and obtain credit cards in other people’s names and run up huge debts. “It is unclear how all of this information has been collected and why the complete social security number of each voter is maintained, if it is not required at the time of registration,” the lawsuit states. Another release from the Secretary of State’s office states they now have a dedicated hotline to call if you have questions relating to this incident 404-654-6045. If you believe this breach of security may cause you to become a victim of identity theft, you should contact the three main credit bureaus. Request an “Initial Alert” be placed on your account. This service is free and places an alert on your account for ninety days. Attorney Jennifer Auer Jordan filed the complaint on behalf of two women and is seeking class action status and relief for citizens affected by their personal information distributed to an unknown number of people. The suit also seeks equitable relief to prevent future disclosure of personal or private information or to prevent future breaches of the security of Defendant’s system as defined by O.C.G.A. 10-1-911 and any equitable relief necessary to prevent harm due to the disclosure. New registration laws only require the last four digits of SSN. Older registration files are not purged of unneeded information unless a voter re-registers and leaves blank any information no longer required such as complete SSN, and telephone number. A person can keep race private by selecting ‘other’.